Whether it is moving dirt, digging holes or trenches, rotary hoeing the vegetable garden, or slashing the paddock the BX25 tractor/loader/backhoe (TLB), available from Kubota Tractor Australia , can be adapted to suit almost any application. The BX25 TLB is unique in its configuration, being a sub compact TLB unit that quickly converts from a full on work horse to a nimble, simple to operate lawn mower. “The simplicity of dropping off the front end loader and backhoe and converting to a mowing unit is a real plus” says BX25 TLB owner, Kevin. Under the metal bonnet, the 23 horsepower fuel efficient Kubota diesel engine provides a combination of high torque rise, low noise and vibration, and cleaner emissions. The engine powers a 2 range hydrostatic transmission, and with heel and toe operation is ideally suited to loader and mowing operations where constant changes of direction are required. The BX25 transmission also comes standard with 4 wheel drive and rear differential lock enabling the BX25 to perform in any conditions. digital tachometer for precise monitoring of engine revolutions, especially when operating the PTO. The main frame of the BX25 TLB is reinforced to ensure its total ability to undertake operations with the front end loader and backhoe. This added strength permits more powerful and stable front end loader and backhoe operations. Kubota BT601 backhoes are fitted standard to the BX25 TLB. These backhoes feature a curved designed boom which allows operators to dig deeper, keeping the boom out of the way of the edges of the excavation area. It also gives a better lifting height to clear obstacles. The BT601 has a digging depth of 1889mm and has a bucket breakout force of 861kg. A 20 degree angle of departure of the backhoe allows for easy loading and unloading from trucks or trailers. Kubota LA240 front end loaders are fitted to the BX25 TLB. The rounded style of the loader arms offers optimal visibility for operators. All hydraulic hoses and pipes on both the backhoe and loader are fully protected against accidental damage. 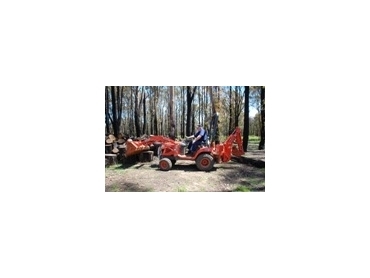 The backhoe and loader are quickly and easily detached and attached to the BX25 TLB. Once the quick detach backhoe and loader are removed the BX25 TLB reverts to a conventional sub compact tractor complete with mid and rear PTO. An optional 54” or 60” mid mounted mower utilizes the mid PTO to provide a professional finish to lawns. In addition, an optional three point linkage kit can be fitted allowing implements such as slasher or rotary hoe to be used.